The Cherry Grove community on Fire Island has a rich, queer history. Since it’s establishment in the 1920s and 30s it has been host to folks who worked in the arts and theater. Building a reputation for sexual freedom and queer sexuality, people would travel great distances to visit. With greater visibility came greater police surveillance and for many years vacationers and residents alike were the subject of police raids. If you were arrested during a raid your name and sometimes your home address would be published in the newspapers, which for many meant the loss of jobs, family, loved ones, and homes. As a resident artist at the Fire Island Artist Residency, I spent a month researching the history of Cherry Grove. In the interest of connecting across generations I met with and listened to residents’ stories from their youth to the present. I shared memories, beverages, and laughs with some incredible people. Queer experience and its translation\transition into queer history is a social process sometimes dependent on alternative forms of record making. Through the act of telling stories and listening we were able to act both as witnesses and as the witnessed. (Sub)merge responds to and references one such story/legend from the Island. During the raids in the 1960’s a resident evaded police arrest by running through the Grove and into the bay. He hid among the reeds, submerged his body in the dark water for hours, used a reed to breathe and remain invisible underwater. I was so struck by the images in the story and what they tell us about surveillance, safety, visibility, and queer experience. I wanted to illuminate and reanimate that image to highlight these issues at a different time in history. (Sub)merge is a four hour durational performance which took place on August 14th at the Grove Hotel/Ice Palace pool in the center of Cherry Grove from 7-11pm. 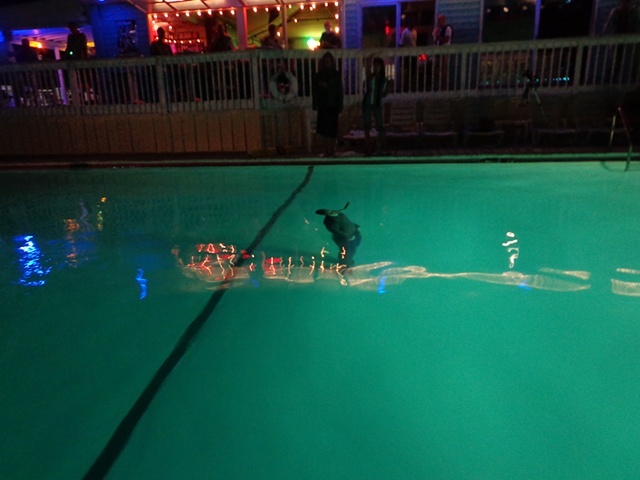 During the four hours the artist remains submerged in the middle of the empty, illuminated pool while audience members look on from the decks and bar at the business. The Fire Island Artist Residency (FIAR) is an organization founded in 2011 that seeks to bring the best gay, lesbian, bisexual, and transgendered emerging contemporary artists to Fire Island, a place long-steeped in GLBT history, to create, commune, and contribute to the location's rich artistic history. FIAR offers live/work spaces for five selected artists who participate in a summer residency while immersed in the Fire Island community. This performance was possible only with the support of FIAR and the Grove Hotel/Ice Palace. Special thanks goes to Chris Bogia, Evan Garza, Nicolaus Chaffin, R.E.H. Gordon, Jade Yumang, Brendan Fernandes, Gabriel Arra, Wendy Lewis, The staff at the Grove Hotel/Ice Palace, and Dennis McConkey. Photo credits for the performance documentation go to R.E.H. Gordon, Jade Yumang.